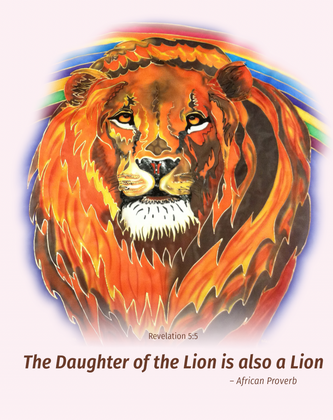 Lion T Shirts - Pink - 3 Strand Cord Silks - Glowing Silk Flags & Billows based on the Bible, Jesus and His Church, to enhance your worship of God! 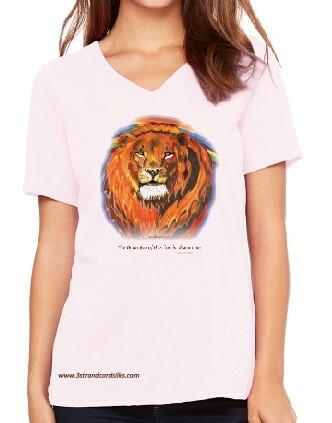 V neck T shirt with original Lion of Judah by the artist. Text reads Revelation 5:5 and "The Daughter of the Lion is also a Lion" - old African Proverb. Shirts come in Light Pink and White, in sizes S, M, L, XL. Easy, relaxed fit. 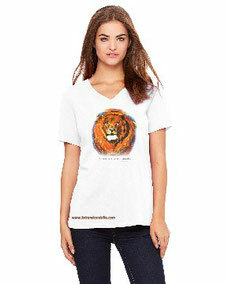 For Lion T Shirts in White, click HERE.